Well, we are still here in Miami. This is a visual explanation of why we haven’t left yet. 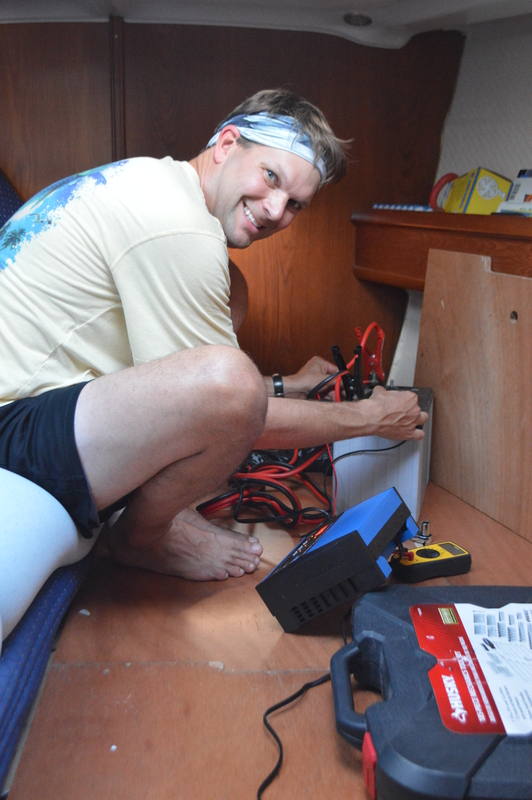 This is Marc with our generator batteries in the V-berth. This is one of three reasons we are still here stateside. This is what went down. This past Thursday Marc and I were getting Adagio all ready to make the Gulf Stream crossing for the following morning. We pulled the dinghy up on the davits, we coiled and stored all our extra lines, we securely stored anything that might tumble in wavy seas, and we checked all systems like our GPS. That’s when we discovered our GPS went on the fritz. When we turned on our chartplotter, there was nothing there. The GPS simply stopped working. What?!? #%&*#@$*!!!!!!!! Yes, we could cross over to the Bahamas the old fashioned way, solely using our paper charts and plotting manually but with three kids on board, we REALLY want our GPS to be full functioning. 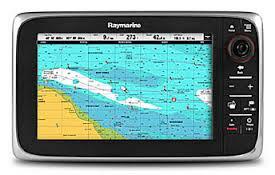 Marc made a few phone calls around Miami and headed to the nearest Raymarine store to buy a new GPS receiver. All afternoon Marc and our friend Chip worked on installing a new GPS and after a few hours they got it working. Then two hours after we got the GPS working, our generator would not start. Really that’s nothing new because Marc is always fixing it but this time the problem was bigger. The volt meter was showing low which means the generator batteries were not receiving a charge. Then 20 minutes later as the sun was beginning to set, our watermaker stopped working. It was now time for a family meeting in the cockpit to inform the kids that we would not be sailing to Bimini in the morning. The kids were sad but understood. Living on the water, Joellen, Camden and Maria have learned to be flexible because our plans change all the time. And our motto while living on a boat is better safe than sorry so our decision was easy. We will stay put in Miami until the watermaker and generator are fixed. Marc fixed the watermaker yesterday but the generator is still not holding a charge. Marc thinks the generator needs a new alternator, so we have a guy coming tomorrow to install a new one. We’d be out of here Tuesday but the weather does not look good for awhile. Crossing the Gulf Stream takes more caution than normal passages. We will only cross when the winds have no northerly component and the winds are less than 15 knots. Because the Gulf Stream runs south to north, any wind from the north creates big waves. Looking at future weather predictions, it looks like we are staying put here for at least another week. The good news is that we are able to explore more of Miami and also get some minor boat and dinghy repairs done that we’ve been meaning to get to. Oh and enjoy more Cuban food! It’s all good. Love your positive attitude!! Great lessons for the kids too – better safe than sorry, be prepared, stop for a better start, etc. All the cliches that have basis in truth. We enjoy all of your posts & pray that you will have a safe trip to the Bahamas & enjoy the sun & surf! So true TR. Give me a call anytime. Love reading your blog. Always so positive. Hope to see all of you when you visit Carmel. Teggie, we will for sure see you in June. Whew!! Like I said…. Never a dull moment! So glad all these things happened while you are docked!! Keep on keeping on!! You certainly have a great motto and a great mechanic! God Bless You on this next leg of your journey!